click photo to enlarge I had New Years Eve off in 2009 so the decision was where to go, where to go. Well, where else but spend New Years eve in a Ghost town, in this case Rhyolite Nevada. 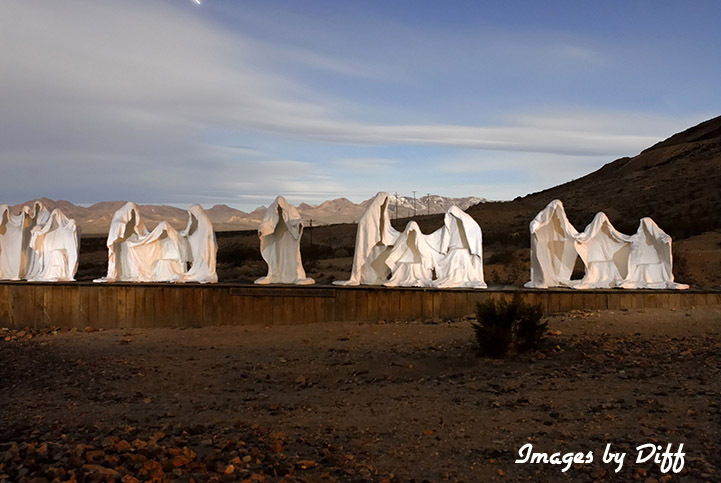 Rhyolite began in 1905 as a mining camp in the Bull Frog Mining District. 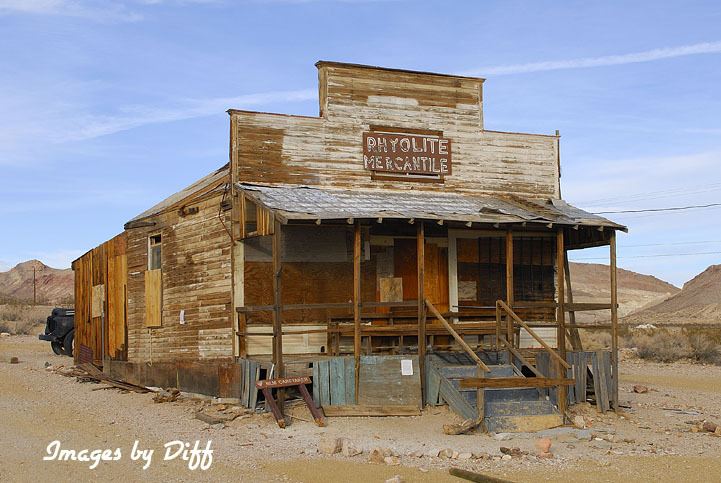 During the gold rush thousands came to Rhyolite, the population swelled to around 4 to 5, 000 people. Mining declined as it always does and by 1910 the population dropped below 1,000. By 1920 it close to 0. 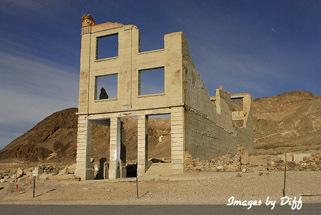 For more information see this wikipedia link to Rhyolite. click photo to enlarge During boom times for these towns much infrastructure gets built to support the miners many needs. The largest being to help them get rid of any gold they had found. Many saloons and brothels spring up to help them unload their gold. But also businesses that sell supplies to the miners. 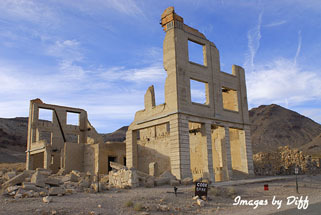 Rhyolite has a number of structure remains still standing. I ran into a number of photographers there during the day but when we went back at night there was only one. click photo to enlarge The three pictures here at the bottom are all taken at night with 5 minute or so exposures. 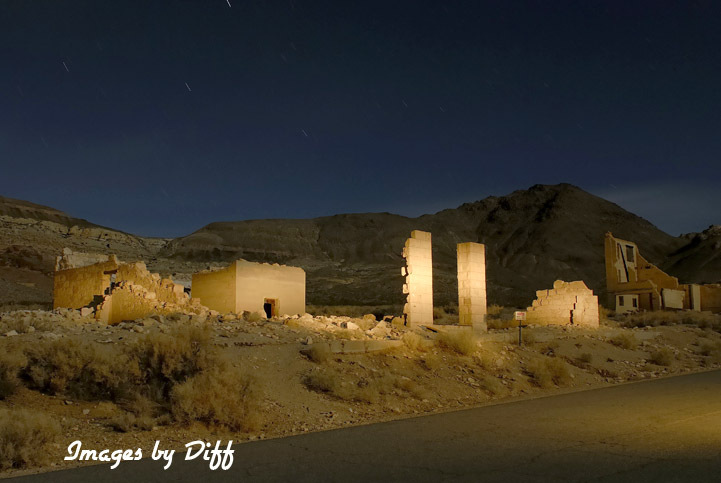 The image of the ghostly looking people at the lower left were done on a 5 minute exposure also but during the exposure I walked up to each grouping and flashed them with my flash to help them stand out even more. Karen was amazed that I could walk across the picture while it was being taken, flash each group of statues yet I didn't show up in the finished product. The statues are part of the Goldwell open air museum just outside of town. They are a Belgian artist's interpretation of the last supper.